Earlier this month, Ford announced its plans of increasing its focus on hybrids with the launch of the first-ever Mustang hybrid in 2020. 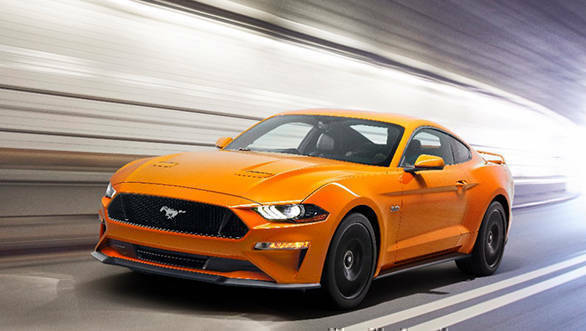 While there is still some time for that to happen, Ford has brought in a refreshed version of the Mustang. It will go on sale in North America in September this year. In terms of design, the 2018 Ford Mustang gets a tweaked grille and bonnet design that make the front look leaner than before. The vents on the bonnet too have been repositioned. Importantly, for the first time, the Mustang gets all-LED headlights with updated DRLs embedded in the headlight cluster. The side profile remains identical and doesn't get any significant update except for sporty alloy wheels. On the rear, the 2018 Mustang gets revised LED tail lamps along with a new bumper and an optional spoiler. 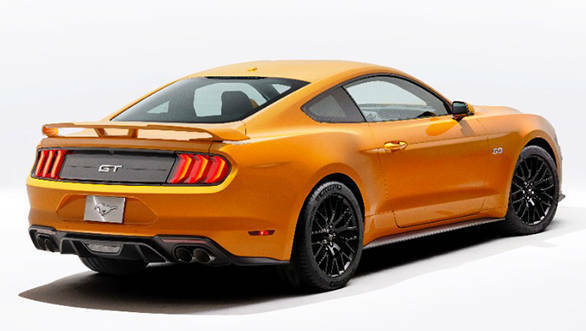 Dual-tip exhaust is standard for EcoBoost Mustang, while the V8 Mustang GT gets a standard quad-tip exhaust. 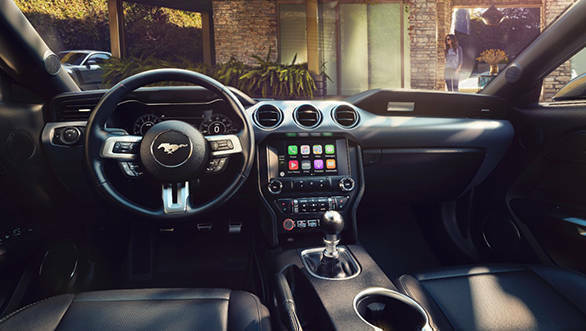 The inside of the 2018 Ford Mustang looks largely similar except for the new 12-inch all-digital LCD screen in the dashboard. The new instrument cluster offers three different themes - normal, sport and track mode. Ford also states that the 2018 Mustang comes equipped with memory function that allows customers to save their favourite drive settings, including suspension and steering preferences. Ford will also offer safety features like pre-collision assist with pedestrian detection, distance alert, lane-departure warning, lane-keeping assist and driver alert system. The major revision in the 2018 Ford Mustang is that the naturally aspirated 3.7-litre V6 motor has been dropped. The pony express will only be available with two engine options. First is the 2.3-litre 4-cylinder EcoBoost motor whose power and torque numbers haven't been revealed yet. Ford mentions that the 2.3-litre motor will offer outstanding performance advantages versus the now discontinued 3.7-litre V6. This unit will make use of an overboost function that makes it more torquey than before. Ford also claims to have worked on the 5.0-litre V8 to make it more powerful and rev higher than the previous Mustangs. The higher power delivery has been achieved with the use of new high-pressure direct injection and low-pressure port fuel injection in the V8 to make it deliver a strong low-end torque, higher peak power output and also improved fuel efficiency. The V8 Mustang will also have an optional feature to crank up the volume of the iconic exhaust note of the motor, ideal to wake up the neighbours at the middle of the night. The 2.3-litre and the 5.0-litre engines will be mated to the new 10-speed automatic transmission that is also offered in the F-150 pick-up truck. The company states that the new unit has quicker shift times, better low-speed response and significantly lower friction losses. The shift pattern can be altered in different drive modes. If automatics are not your thing, Ford will offer the 6-speed manual transmission as standard. We did reach out to Ford India to know its plans of launching the 2018 Ford Mustang in India. 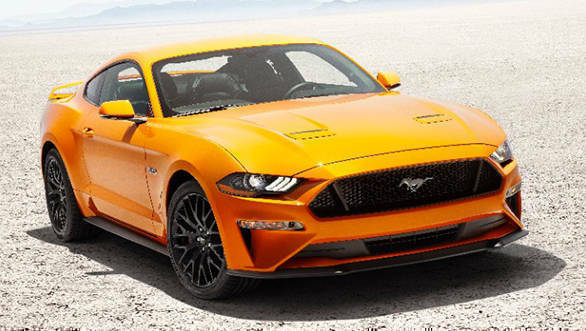 The company stated that the refreshed Mustang should make it to our shores later this year or early next year.